VON is a leader in the delivery of innovative community home-based care and social services. Click “Read More” to learn why accreditation is important and sets VON apart from other healthcare organizations. VON has been touching lives of residents throughout the County of Chatham-Kent since 1938. VON Sarnia-Lambton is at the leading edge of a preventative strategy designed to allow people to remain healthy in their homes and reduce the demands on our local hospitals and nursing homes. 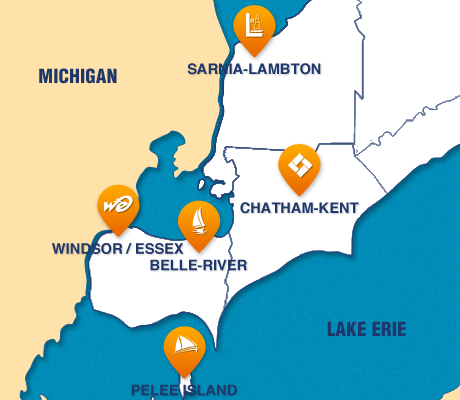 VON Windsor-Essex was established in 1927 and is dedicated to being a leader in the delivery of innovative comprehensive health and social services in Windsor-Essex. A big thank you to Christ Church for their generous donation of $750 to help support our Programs and Services. Through their Lenten Lunchtime Worship Series they collected donations throughout the 7 weeks and decided this year that VON would be the receipents of those donations. We are so thankful for this donation and to Christ Church. Read more about Christ Church donates $750 to VON Chatham-Kent!! 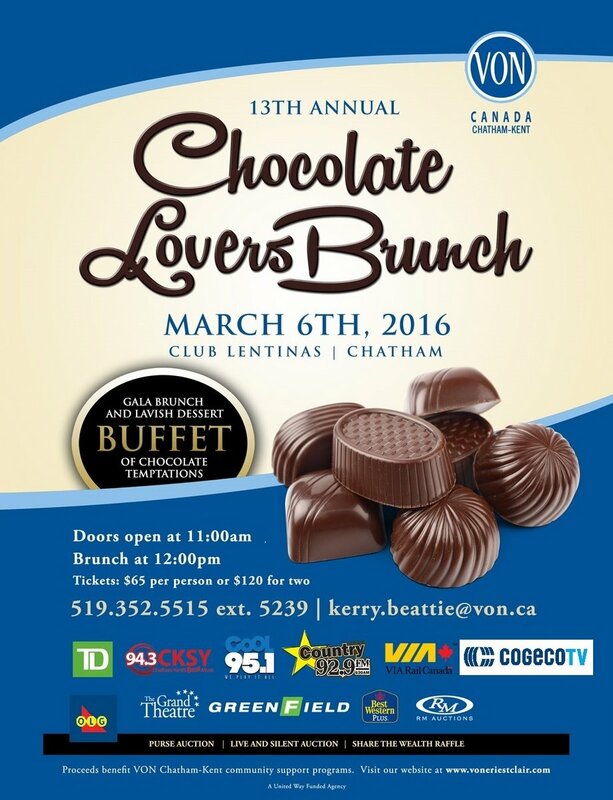 13th Annual Chocolate Lovers Brunch raised over $12,000! Kids’ Circle - Volunteer Visiting and Telephone Assurance - Supportive Care Visiting - SMART (Seniors Maintaining Active Roles Together) - Chronic Pain Management - Visiting Nursing - Home Support and more. 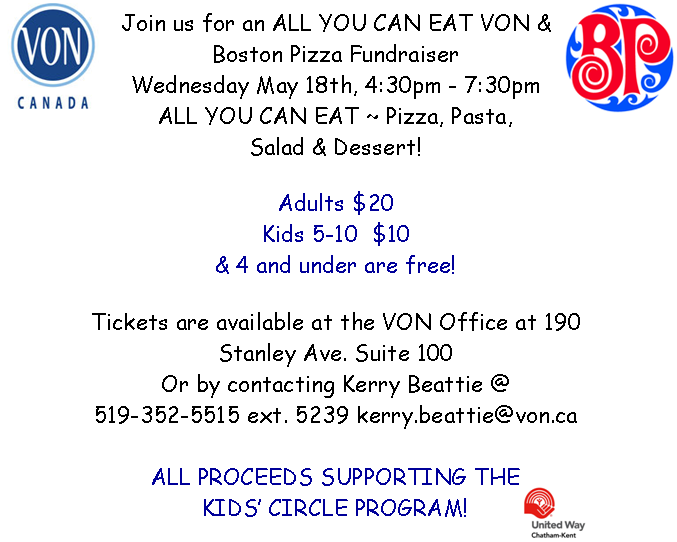 Year after year, VON Chatham-Kent relies on this signature fundraising event so that we may maintain and expand our services and reach out to more people in our community. Many thanks to the ongoing generosity of our corporate sponsors and donors, who have been able to help continue our fund raising efforts. Thank you for supporting VON Chatham-Kent. We need your help! Volunteer opportunities are available in your community. Choose a location below to volunteer. Help us, help your community. All donations are used to support important programs in your community. Choose a location below to donate. Find phone number, fax number, address and map for each site. Choose a location below to contact. Please use our interactive map to find your nearest VON site. Choose a location below for your local news.